McLuhan, my latest WordPress theme, is now available as a free download on the WordPress.org theme directory. 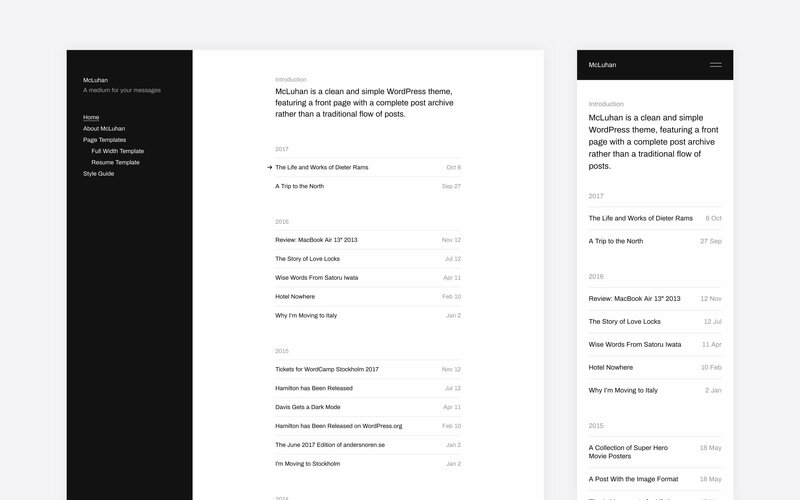 McLuhan is a bit different from my other themes in that it doesn’t display posts in a traditional blog flow, with ten post previews per page. Instead, the posts are displayed in a compact list arranged by year, with all posts displayed on the same page (pagination is also included, of course, if you prefer that sort of thing). If you’ve been to the Writing section on my own site, the structure will probably look pretty familiar. You can read more about what’s included in McLuhan here. You can download the theme directly from WordPress.org, or install it through the Themes section of your WordPress administration panel. Special thanks to Chetan Prajapati and Nilambar Sharma, who reviewed McLuhan before it was released on WordPress.org.